Catechization must be present in every parish community. It has to embrace all parishioners, from children to adults. Catechetical ministering of adults must be carried out according to their professions and interests. It should be taken into consideration that catechetical work among teachers, doctors and, generally, intellectuals, is not developed. This conclusion was made by Fr. 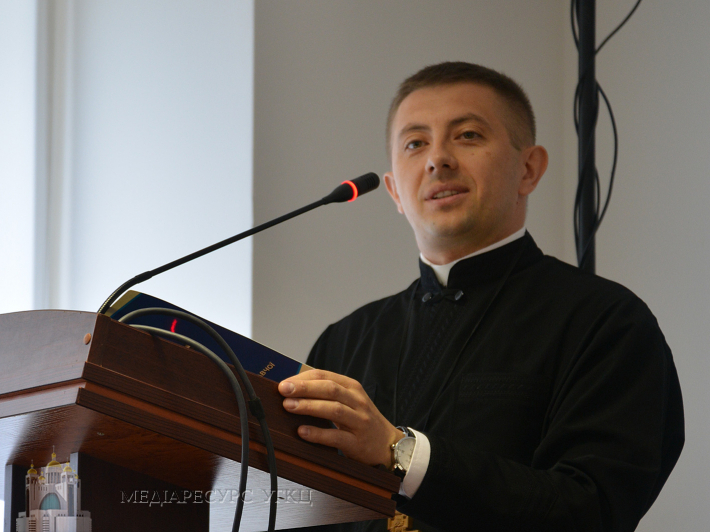 Roman Ostrovskyi, PhD in his report “The Word of God as a basement of catechetical ministering” at the Synod of Bishops which is taking place in Lviv-Briukhovychi from Sep 2-12, 2018, a theme of what is “The Word of God and catechization”. The speaker points out that nowadays in Ukraine the interest in religions and, particularly, in Bible is highly increasing. Nevertheless, it is somewhat incompatible with the level of knowledge of the audience. A preacher or catechist needs to know more so to be able to explain the nuances of Christian theology. In his report, Fr. Roman covered the following points: catechization and the Word of God, biblical apostolate, Services and the Word of God, a homily and the Word of God with suggestions related to the content of a homily and catechization. Successful catechization, as for the speaker, would obtain such characteristics as beginning with the Word of God, learning about the Word of God, and as a consequence – preparing faithful to the meeting with Christ – the Word of God. The report signals that recently UGCC has received huge achievements in catechization of believers. According to the statistics of 2018 the number of catechetical schools and Bible clubs has increased. However, Church ought to admit that catechization has not become a permanent and fixed process of forming a Christian in Ukraine. It is mainly narrowed to the First Communion, and only at the separate parishes it is an activity which embraces a wider circle of participants. Fr. Roman assumes that we have to acknowledge – the level of knowing and understanding Bible among our faithful is very low or even absent. What means that we have to work on it to improve the situation by including more percent of Holy Bible into a homily. Last, but not least is to teach people pray and share faith. Saying everyday prayers, a person must not only pronounce but comprehend them.